Fix template output in some senario. Open "Extensions" from Activity Bar. Click "Install" button. After install finished, then click "Reload". Or install JSTool manually, see Help. 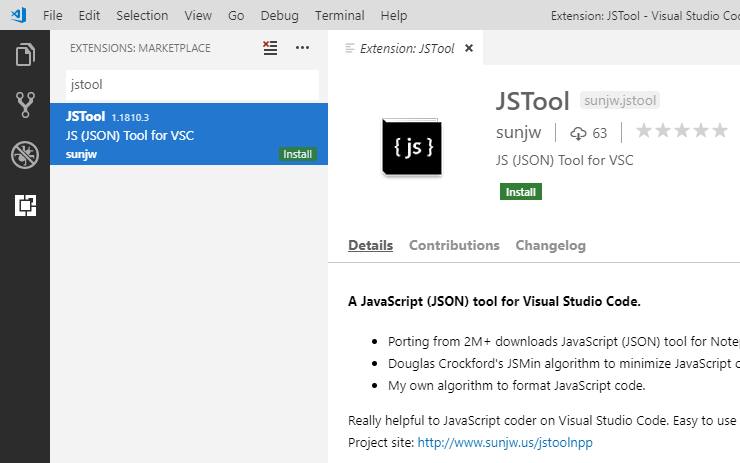 Visit JSTool page in Visual Studio Marketplace. Click "Download Extension" on right side. Using the "Install from VSIX..." command in the Extensions view command drop-down, or the "Extensions: Install from VSIX..." command in the Command Palette. Select sunjw.jstool-x.y.z.vsix you just downloaded. Under "Enabled" section, select "JSTool". Select source code lines which you want to format. Open you JSON data file in Visual Studio Code. Using the "JSON Sort" command in the Command Palette. If you want to put sorted JSON data in a new file, using the "JSON Sort (New file)" command. Visit Key Bindings for Visual Studio Code and follow the steps. Except where otherwise noted, content on this site is licensed under the Creative Commons Attribution Share-Alike License v3.0.